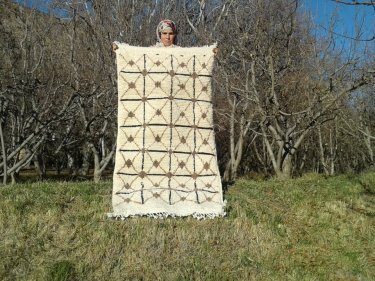 Pile rugs carry huge traditional cultural significance in the Ait Bouguemez valley. 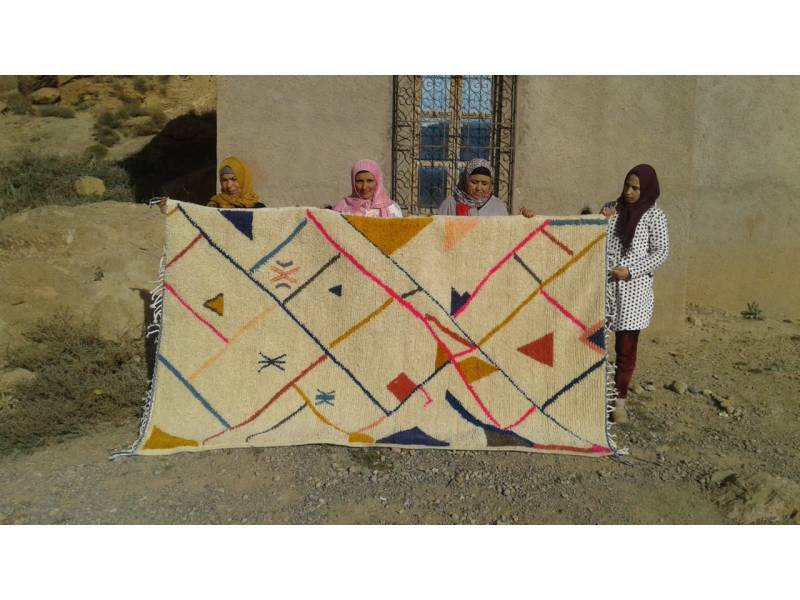 When a family first builds a house, or moves into a new home, the first thing women do is weave rugs specifically for each room. All you have to do to learn when a family first built their home or moved into a home is to ask them how old their rugs are. 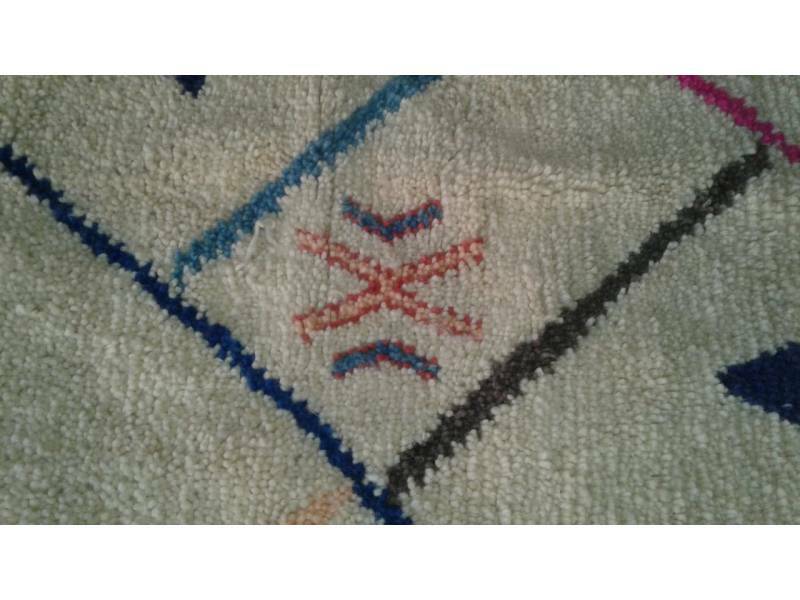 Often, the rugs are more than 20-60 years old even after consistent ware. 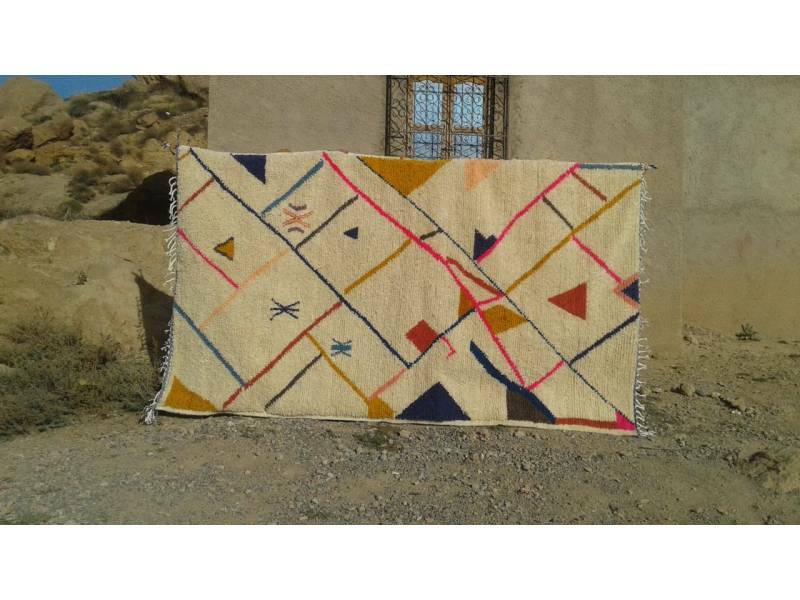 The designs of Timdokkals are highly unique to the area and are often referred to as "Azilal Rugs", the province in which Timdokkals is located within. This plush rug can add warmth and comfort to any room. 10380Dh: This price includes shipping within Morocco. To order, e-mail us at hello@theanou.com and we will help you with payment options. 10380Dh: Le prix inclut la livraison au Maroc. Pour passer commande envoyez nous un message à l'adresse hello@theanou.com et nous vous présenterons les différentes options de paiement. Want to visit Ighrem Timdokkals in person? The cost is $10 USD per person, all of which is donated to the cooperative. Visits include tea, snacks and work demonstrations! Fill out the form below and we'll send you additional details and payment options when artisans confirm your time. Check their general location here to plan your future trip. When your visit is set up, we'll send you a specific meet up instructions and location of the artisan's workshop. Khadija as a native of Agouti and has lived in the village her entire life. She completed primary school and ... show more Khadija as a native of Agouti and has lived in the village her entire life. She completed primary school and hopes to study again one day. When Khadija is not embroidering or crocheting new items at the association, she can be found working in her family's field. She hopes that through the sales of her items, she'll be able to support the growth of Association Ighrem and Timdokal Ighrem. 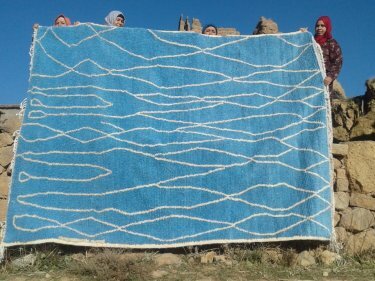 To make this item, the artisans of Timdokkal source wool from shepherds and clean it ... show more To make this item, the artisans of Timdokkal source wool from shepherds and clean it in a local river that passes through Agouti. 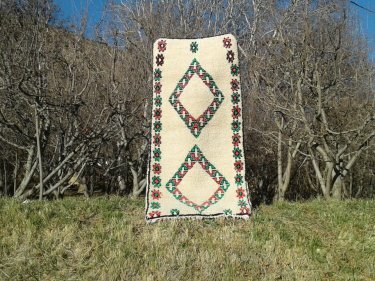 The warp of this rug is made from cotton and is sourced in local markets. 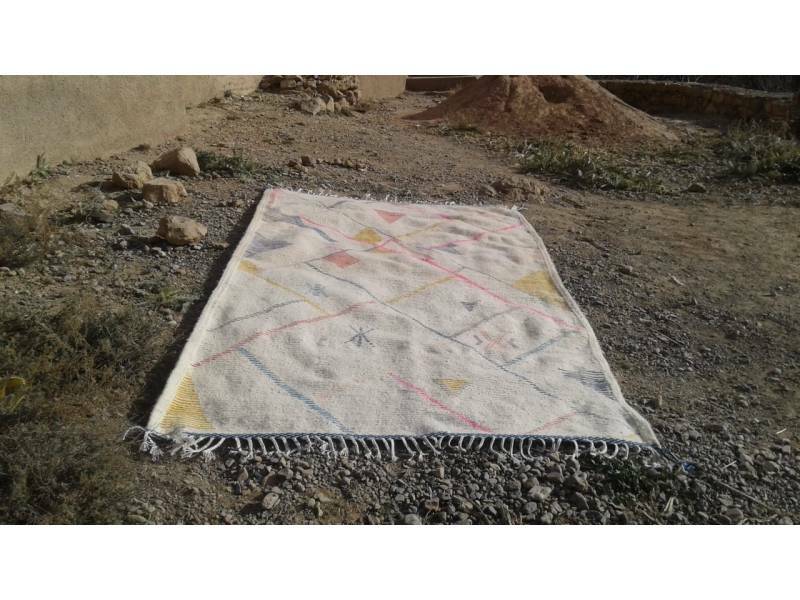 show more The warp of this rug is made from cotton and is sourced in local markets. 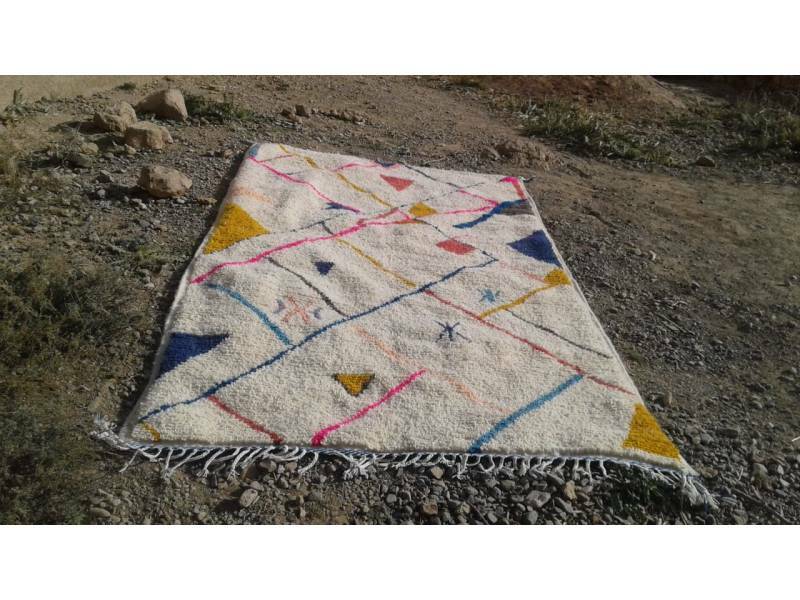 Typically, a village in Ait Bougamez will share one loom and pass it house to ... show more Typically, a village in Ait Bougamez will share one loom and pass it house to house, woman to woman, so each family can produce the rugs they need. At the cooperative the women are saving money to buy permanent looms to keep at their small store.